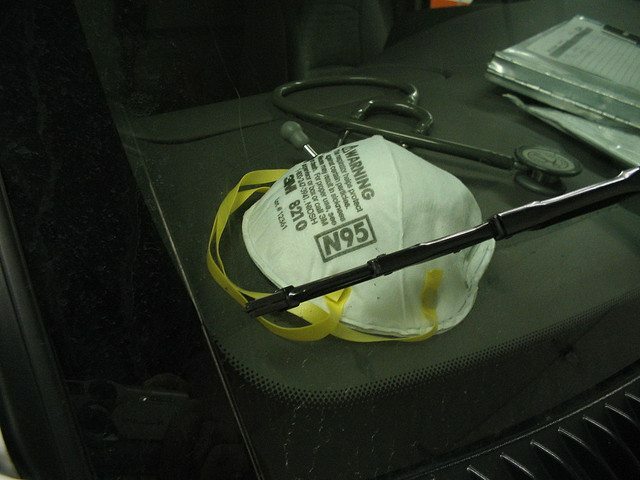 The tenth anniversary of SARS has gone with little recognition from Torontonians, and that's a problem. Photo by phot0geek, from Flickr. In the lobby of Toronto General Hospital’s new Robert R. McEwen Centre Atrium, surrounded by staff and visitors, sits a soapstone statuette encased in glass: a two-foot depiction of an Arctic hunter holding a spear, grappling with a walrus. It’s an unlikely object to find in a hospital foyer, apropos of nothing and seemingly abandoned, as if labourers got tired and decided to set it down beside the Starbucks for lack of a better resting place. For Toronto, the North American epicentre of SARS, there has been an uncomfortable silence during this, the tenth year since the virus killed hundreds of people worldwide. On February 26, 2003, a human carrier of what would eventually be termed severe acute respiratory syndrome disembarked from a plane at Pearson International Airport and set in motion an episode the likes of which the city hadn’t seen since Spanish influenza struck 85 years earlier. By the end, Toronto’s international reputation was tainted, with overall economic losses estimated at between $1.5 and $2.1 billion. And yet, besides some perfunctory photo essays in the dailies, there has been little recognition of this anniversary. The fact is, we need to remember what happened. Some might muse sarcastically, “Should we have a celebratory SARS parade down Yonge Street, then?” What exactly would rehashing the memory of a deadly virus accomplish? The answer is that doing so would highlight a very real and still-present danger—that of global pandemics in a world characterized by increasingly accessible cross-continental travel. Some commemoration would also help us confront the inadequate state of our public-health environment at the time the virus struck. In other words, remembering SARS is a means to help us prevent future tragedies. At the start of the outbreak, one of Ontario’s many handicaps was that it was the only province lacking a regional health authority. In other words, there was no body to oversee the twenty-eight hospitals operating in the GTA, all of which, because of the power-sharing structure of the time, operated largely autonomously. The flow of information about the virus and its spread was further hampered by the lack of a shared reporting database. Economic asceticism in the ’90s meant that, in 2003, Toronto Public Health, which ended up being responsible for the majority of SARS cases, was still collecting all of its case information on paper. There was no timely process for preventing a patient whose condition was unknown from spreading the virus before the system could process his or her diagnosis. It’s significant to consider what else was going on ten years ago. North America was still reeling from 9/11, figuring out how to untangle its traditional defences against any number of then-unknown domestic threats by air, land, and even (in the case of subsequent fatalities by anthrax) post. Locally, there had been Hepatitis B and C contaminations of our blood supply. There was the E. coli outbreak in Walkerton. When SARS arrived, we had had every opportunity to anticipate something. After decades of neglect and severe (and in hindsight untenable) service cuts, with the ribcage of public infrastructure visible to those struggling to make it work on a day-to-day basis, Toronto’s municipal health service didn’t stand a chance. There was nothing in the rulebook about what to do with an outbreak like SARS, because there was no rulebook. The city is safer now. The Martin Liberals established the position of Minister of State for Public Health on their first day in office. Shortly afterward, they created the Public Health Agency of Canada, which is dedicated to, among other things, the prevention and control of infectious diseases, as well as preparation for public-health emergencies. Investment initiatives have seen funding for Ontario public-health units increase dramatically. The province now has an advisory committee (the Provincial Infectious Diseases Advisory Committee) the goal of which is to oversee matters related to immunization, infection prevention, and surveillance. And this is all good, because while SARS was beaten back, and while we have established a vigilance toward infectious disease in Canada where before there was none, it’s simply a matter of time before another threatening virus or bacterial strain appears. The lives Toronto lost to SARS illustrate the dangers of the previous decade’s austerity measures: out of the 251 people who contracted the virus, 44 of them died. That’s 18 per cent—the highest percentage of deaths in any affected country. It would be encouraging to believe that we’ve learned our lesson: the backwards folly of sacrificing lives and infrastructure in blind service to the economy. But part of learning is remembering, and the lack of meaningful commemoration, this year in particular, signals a worrisome amnesia. Do we just wait for those who publicly escorted us through SARS to pass away—like Drs. Sheela Basrur and, more recently, Donald Low—to trigger our collective memories, as if it were all just a bad dream? It speaks to our character as a city that Toronto is able to wax nostalgic every year over a power blackout, yet one of its greatest crises, a great and tragic teaching moment, goes without recognition. SARS has become anonymous, not unlike a soapstone statuette in a hospital foyer.